Chickpea salad is an easy, delicious & healthy meal, perfect for school lunches! I make this recipe often, and it can be served on top of greens, with crackers, on a sandwich or straight out of the bowl! Add chickpeas to a large bowl and mash with a potato masher. You want a sticky consistency while still leaving some whole chickpeas. As a nursing mother myself, I’ve been hearing a lot about lactation cookies. Becoming quite intrigued with them, I began to research exactly what is in these magical treats. Two of the most beneficial ingredients to increase milk supply are believed to be brewers yeast & oatmeal. I did notice however that many of these seemingly healthy cookie recipes were loaded with sugar! Up to TWO cups of sugar! Plus a full cup of butter and white flour. That’s dessert, not a snack. If you want dessert, find one of those recipes, but if you want a plant based muffin that can energize your body and provide your baby with much needed nutrients, give my muffin recipe a try. Oatmeal is full of fiber and is a great vegan source of iron. Maternal anemia is shown to result in a lower milk supply, which may be why some women struggle to produce enough milk. Oatmeal is also thought to create a relaxing affect causing the body to release oxytocin which may help with letdown. Brewers Yeast is a galactagogue herb, (aka an herb that increases milk supply in nursing mothers), and is considered safe for breastfeeding. it’s a good source of iron, chromium and selenium along with several B vitamins. Coconut oil is not only believed to increase milk supply, but it also produces fattier & more nutritious breast milk, as it contains high levels of lauric acid. I understand that busy moms struggle to find time for baking, but I assure you that these muffins take only minutes to prepare and you can whip them up in one bowl. I make them them twice a week and my ten year old goes crazy for them! As always, I encourage you to use organic ingredients if possible, especially while breastfeeding. combine all ingredients except powdered sugar and pour into greased muffin pan. 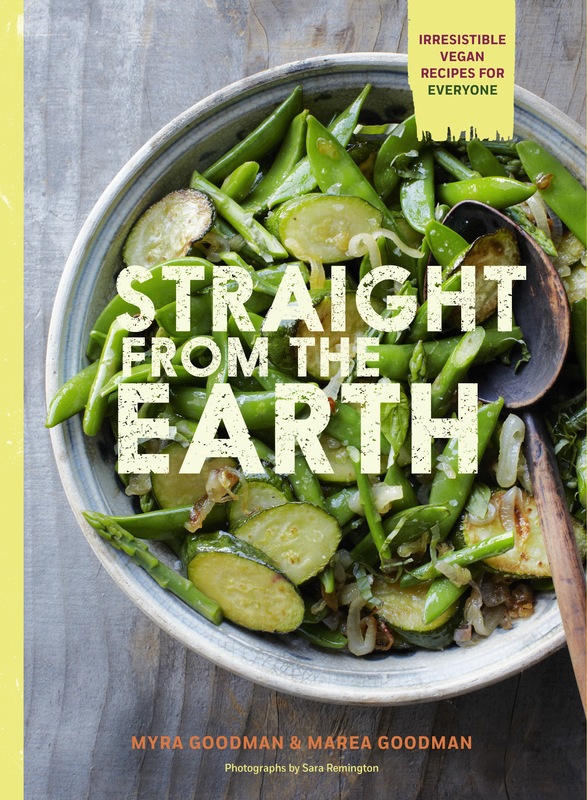 “Straight From The Earth” Cookbook Review. I have recently been introduced to a cookbook written by a health minded mother & daughter duo named Myra & Marea Goodman. 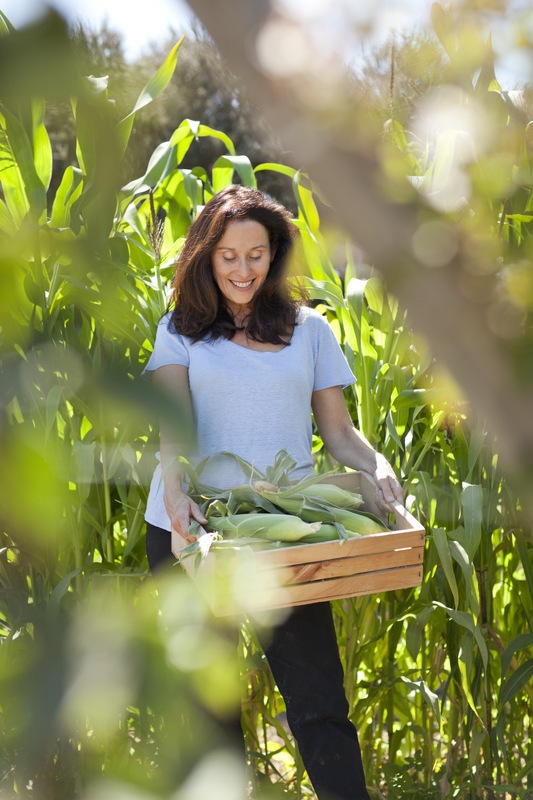 Their book “Straight From The Earth” offers dozens of plant based recipes that utilize whole foods to create meals that are nothing short of amazing. You will find recipes for ‘Hearty Beet Soup’, ‘Cabbage & Carrot Crunch Salad’, ‘Grilled Fig Sandwiches’ & ‘Plantain Tacos’, just to name a few. 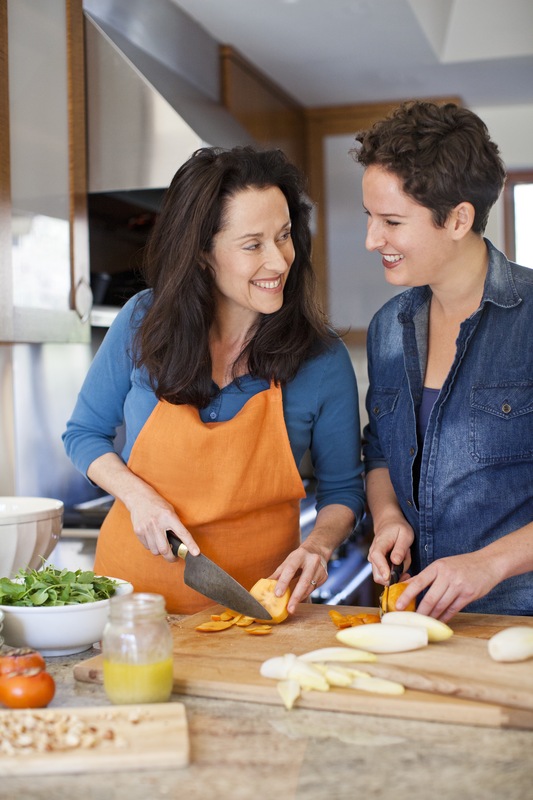 The recipes were created & tested by these two talented ladies, and their passion for food is apparent on every page. Here are two recipes that I have recently made for my family. Enjoy! I prepared this delicious loaf while my kids were at school. I had a nice, quiet kitchen and I enjoyed the entire process of creating an amazing meal for my family. The ingredients for this recipe are packed with nutrients & protein, and the flavor of the mustard & spices is simply phenomenal. It takes a bit of prep time to make this loaf, but I assure you that it is well worth every minute. This would be a wonderful meal to make for an everyday family dinner or a celebration with friends. In a medium saucepan, bring 2 ½ cups/600 ml of the stock to a boil. Add the barley and ½ tsp salt. Return to a simmer and cook, covered, for 30 minutes (or for just 15 minutes if using pearled barley). Add the quinoa, return to a simmer, and cook covered, for 15 minutes, or until all of the water is absorbed. Remove from the heat, but leave the grains in the pan. Position a rack in the middle of the oven and preheat it to 350°F/180°C/gas 4. Generously grease a 9-by-5-in/23-by-12-cm loaf pan and set aside. Mix the chia seeds with the remaining ½ cup/120 ml of the stock and let them sit. The seeds will become thick and gelatinous (this is our egg substitute, which also adds great nutritional benefits). Meanwhile, heat the oil in a large skillet over medium heat. Add the onion and cook for 4 minutes, stirring occasionally. Add the carrots, celery, and garlic and sauté for 2 minutes. Add the oregano, ¼ tsp salt, and a pinch of pepper. Cook, stirring frequently, until the vegetables are tender, 3 to 5 minutes. Add the beans to the pan with the grain mixture. Mash the mixture with a potato masher until the beans are partially broken up. Add the sautéed vegetables, bread crumbs, pine nuts, chia seed mixture, parsley, and mustard and stir until well combined. The mixture will be thick like cookie dough and a bit of a challenge to stir. Season with salt and pepper. Transfer the mixture to the prepared pan, press down and smooth out the mixture, and bake until the top is firm and golden brown, 45 to 55 minutes. Allow the loaf to rest for 15 minutes before cutting it into slices and serving. These cookies are like nothing else I have made before. I can’t believe that I never thought of adding sesame seeds to cookies! Now I’m going to be throwing them into everything I bake! The flavor of the orange zest is a wonderful addition. Once you make these cookies & realize how simple and tasty they are, you will make them every time you have company over. I know I will! Position a rack in the middle of the oven and preheat it to 325°F/165°C/gas 3. Lightly grease two baking sheets and set aside. In a large mixing bowl, combine the flaxseed with the hot water. Allow to sit for 5 to 10 minutes until it thickens (this is our egg substitute). Whisk briefly, then whisk in the sugar, oil, syrup, and zest. In a medium bowl, whisk together the flour, sesame seeds, chopped hazelnuts, baking powder, cinnamon, salt, and ginger. Stir the dry ingredients into the wet ingredients until just combined. Using a tablespoon, scoop out 30 heaping tablespoons of cookie dough. Roll the dough into balls, then arrange fifteen on each baking sheet, spacing them about 1 in/2.5 cm apart. You should have three rows of five cookies on both sheets. Press down on each ball until the cookie is about 1/3 in/8 mm thick. Place a whole hazelnut in the middle and press down so it’s snug. Bake until the cookies are golden brown, 10 to 15 minutes. Transfer the baking sheets to a wire rack and let the cookies cool for a few minutes before transferring directly to the rack to cool completely. The cookies can be stored in an airtight container at room temperature for up to 2 weeks. I have recently been introduced to a cookie that hands down takes 1st place in cookie deliciousness. In fact they are so delicious, you will truly want to savor every bite. Pipernilli cookies are baked fresh daily in Brooklyn NY. using fruits & veggies such as sweet potatoes, bananas & carrots. They are soft and moist with incredible flavor. My favorites are Banana Chiffon & 14 Karat Cake. If you are looking for a special Vegan treat for your Valentine, you may want to buy some Pipernilli Cookies! This is a quick & easy recipe that your kiddos will most likely enjoy! Cook the tempeh for 10 min in veggie stock & soy sauce. Remove the tempeh & save the liquid. Heat oil in skillet & sautee’ tempeh until brown on both sides, also sautee’ the peppers & onions. 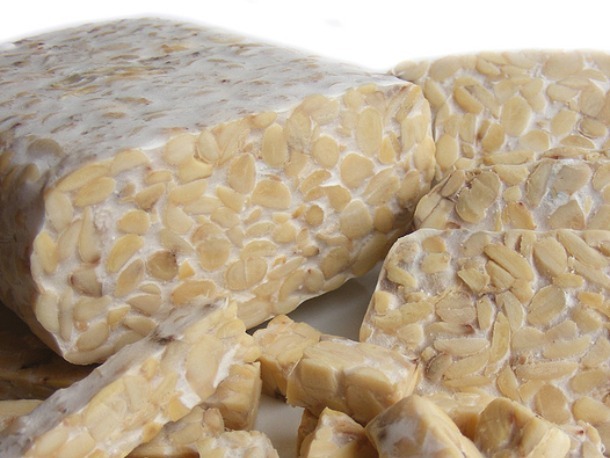 Add pineapple juice to tempeh liquid and cook, adding vinegar, agave, soy sauce & cornstarch. Heat until thickened. Combine sauce with tempeh, peppers & onions. Serve over brown rice. Spelt is an ancient grain which has been referred to as “The Grandfather Of Wheat”. Spelt flour is high in fiber & manganese. If you are not familiar with the trace mineral “manganese”, just take note that it helps your body utilize key nutrients, protects cells from free radical damage, maintains normal blood sugar levels, promotes optimal function of your thyroid gland and keeps bones strong. And only 2 oz. of spelt pasta contains 8 grams of protein. Spelt flour is more easily digested than wheat and is often tolerated by those with “Gluten Sensitivity”. This is not a gluten free food however, so those who have a gluten allergy should not try spelt without their doctor’s approval. Spelt has also been shown to lower LDL cholesterol and reduce the risk of diabetes. A complex carbohydrate found in spelt known as mucopolysaccharide, is thought to boost immunity & prevent blood clotting. If you are thinking that this information sounds great, but are wondering how you will get your kids to actually eat spelt, no need to worry. Spelt flour pasta is delicious, and truthfully my kids don’t even taste any difference from their usual whole wheat pasta. My favorite brand is “Vita Spelt”, and they offer many varieties of pasta including spaghetti, angel hair, penne & rotini. 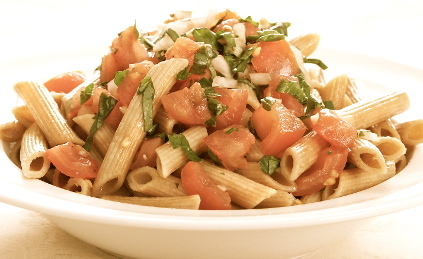 I recently made spelt penne tossed with fresh tomatoes, onions, garlic, basil, parsley & olive oil. So easy. So healthy. And truly delicious!